It has been ravaged all summer with the worst wild-fires in it's history but drought is the real killer in parts of Portugal. Droughts have become more frequent and prolonged in Portugal, with a decrease in the annual average rainfall, which mainly affects the south, climate expert Filipe Duarte Santos said this week. Compared to the years since 1960, annual average rainfall has decreased across the Iberian Peninsula and in other areas in the Mediterranean. "In Portugal's case the decrease is around 40 millimetres per decade which is a significant amount, so 200 millimetres of rain in half a century, that is 20 centimetres of water, said the professor. The current drought in Portugal has been considered the most intense, prolonged and worst of the last 100 years. A drought like this in the Middle Ages would have been dramatic, the country would have been in deep hunger crisis, he added. 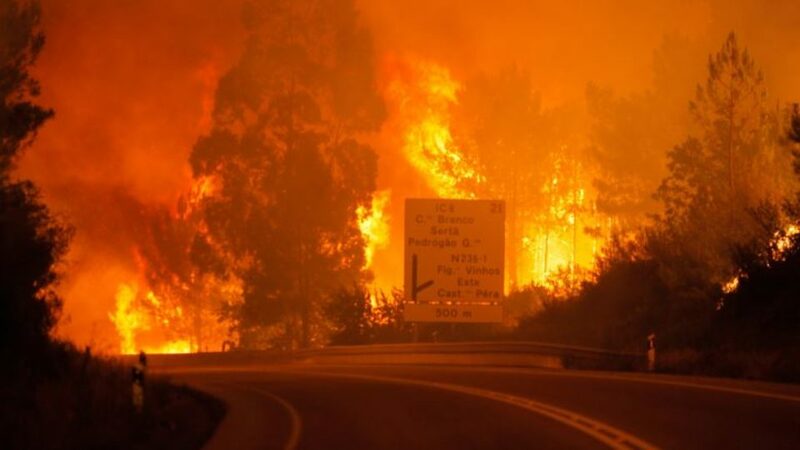 In June 45 people died in central Portugal when forest fires "of great violence" exploded during heatwave of 40 C (104 F). It is not yet known what caused the fires, which also burnt down many houses in the area. An official claimed said dry thunderstorms could have been one possible cause. In October a series of at least 145 wildfires burned out of control and was responsible for the death of 27 people with 50 more injured in Portugal's worst day of the year for forest fires which was caused by an incredible 36 deg C,100 deg F temperatures from Hurricane Ophelia.